Hi, I’m Stephen Hayes, FEI Dressage Rider and trainer from Great Britain, based in New York and Florida, USA. This is an article I’ve felt brewing for a while now, having taught many clinics around the world I feel like I’ve had a really good share of many different types rider, there is the brave and bold, the shy and timid, the rider that has a little devil on their shoulder constantly tearing them apart, the rider who attends my clinic already knowing everything there is to know about Dressage (even the best of the best will admit there is lifetimes of more knowledge to be learnt), there are the diamonds in the rough, the adult amateurs who put their heart and soul into every second in the saddle, the die hard professionals, riders triple my age and being an amazing role model. There isn’t a day that I’m not trying to improve my teaching style and methods, but there is always a couple of subjects which replay time after time in each clinic. Here is just one! 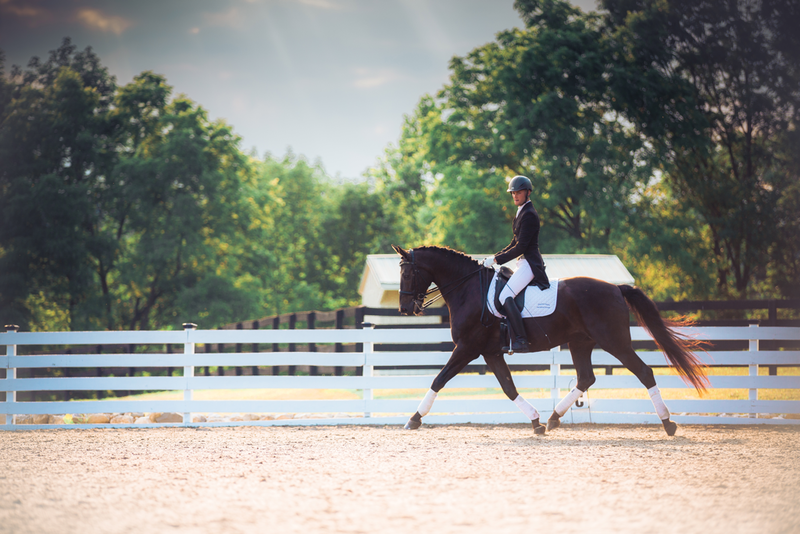 Contact is such a massive and wide ranging word in dressage, and that’s why Dressage is so beneficial to all Equestrian sports. Contact is such an important and beautiful aid that many riders are not taking full advantage of or on the other hand abusing. Contact is very similar to a loaded gun, used correctly and in a positive and productive way it’s a VERY useful tool. Used in a negative way, then a loaded gun is no longer a useful tool. I’m sure we have all seen a situation where the contact is being abused, that’s easy to notice, but I’m going to talk about the opposite end of the scale, which are much more humane scenarios to the horse, but are still not beneficial to the horses physical and mental well being as the rider is still not truly connecting with their horse through the reins. I have seen riders so brainwashed to avoid using their inside rein that their literally riding around the arena in constant counter flexion. A riders inside leg absolutely creates bend but if your not at all touching your inside rein... ever... Then how the hell can we expect the horse to be truly flexed around a circle/pirouette/half-pass the list goes on. The inside rein is an ingredient that you NEED, direct the neck to correct flexion, and let your inside leg be a boundary like he’s walking around a lamp post, use the inside rein in conjunction with your inside leg and outside half halt. It’s a balancing act of the three aids. Of course don’t abuse the inside rein but certainly don’t avoid it altogether. There is SO much to cover on contact, I could have you here all day but one last thing. Giving and taking of the reins, the whole concept of a release of a particular rein or both is a reward. I see people giving and taking every milli second. Do you give your dog a treat if he’s dragging you around the park? Do you give your dog a treat if he’s jumping up at you if your asking him to sit? Are you feeding your dog a treat every second as he’s sitting down or do you let him sit and wait there are few moments till he’s earned the reward. You see where I’m going with this? ​You are your horses teacher, the ‘give’ is when your horse has yielded to the contact and is chewing and suckling the bit. Not when he’s ripping your shoulders out their sockets. That’s not to say Im asking my riders to stay on the end of the rein like a brick house, of course not, you have to be productive. I want my riders massaging and manipulating the corners/bars of the horses mouth through a consistent contact, until the horse decides to unlock and let go of his jaw/poll/neck while moving forwards and sideways from his riders leg aids. That is then your window to reward, he’s going to love the feeling of being relaxed and loose in his poll, throat lash area and neck, thousands of endorphins are being released while doing so, and in return you push forward your hands from his wither for a moment. That’s the real idea of a give. That’s how he will learn to want to soften to your hands, he’ll eventually understand that your hand is guiding him to a better place, now your hand has become a friend, and it’s being productive to your horses mindset. He will no doubt begin to follow your lead. Unfortunately horses don’t read a book at night on ‘how to become more supple’ they have NO idea unless we show them the way, and one way in conjunction with other aspects is through your HANDS. So don’t be afraid of the contact, it’s a beautiful thing once being used correctly.